Residents of New Mexico exult in exploring its deserts and canyons, running its rivers, and scaling its peaks. We also appreciate close-to-home parks and trails that connect us to nature and the places we love. The Trust for Public Land works throughout New Mexico to create parks and conserve land where all Southwesterners can experience nature. We’ve helped to build local, national, and state parks and recreation areas, establish trails, and conserve Southwestern cultural landscapes, farms, and forests. At more than 3.3 million acres, the Gila National Forest in southwestern New Mexico is the sixth largest national forest in the Lower 48. It’s also an important habitat in arid New Mexico, providing a healthy watershed home to many of the state’s native plants and animals. Protection of 783 acres at Broad Canyon Ranch in Selden Canyon, a threatened 11-mile stretch of the lower Río Grande, offers eager birders and others access to a restored Swan Pond plus a mile of riverside woodlands of revitalized cottonwood and willow. The Trust for Public Land is working to protect the Double E Ranch in southwest New Mexico, an outdoor playground for hikers and rock climbers and unparalleled wildlife habitat for bighorn sheep, black bear, Coues white-tailed deer, and many migratory birds. The scenic High Country Ranch offers dramatic views and richly diverse habitat. But at 11,655 acres, this property in the Rio Vallecitos watershed is at high risk of development. This 16,000-acre working cattle ranch in western New Mexico is home to more than just cattle. In 2005, TPL secured 150 acres of private land at the northern boundary of this 400-acre state park near the Río Grande that became the park's education center. In September 2015, The Trust for Public Land completed a five year effort to forever protect Miranda Canyon by adding it to the Carson National Forest, ensuring that all of the area's scenic, recreation, historic, wildlife habitat, and natural resources will be preserved and accessible. Helping rural communities stay viable by protecting the local farms, ranches, and working forests. For generations, Native American and Hispanic people have used the scenic, mountainous land northwest of Taos for hunting, grazing, and the gathering of herbs, medicinal plants and firewood. 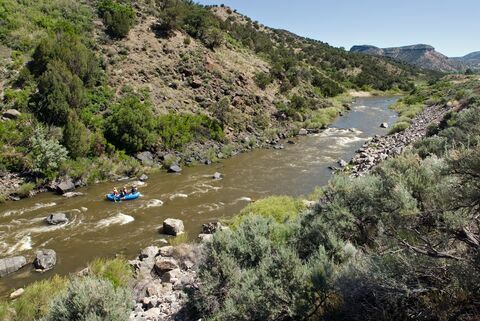 The Trust for Public Land is working to preserve vital stretches of the Rio Grande to safeguard fragile watershed, protect drinking water supplies, and revitalize river habitat for public enjoyment. Working with the U.S. Forest Service, The Trust for Public helped protect 1,280-acres of the Tampico Springs Ranch in the Cibola National Forest. The Taos Valley Overlook project was completed in April 2003, protecting a total of 2,581 acres of this scenic vista that helps make the Taos area a unique treasure for residents and visitors alike.